Get your MP to the House of Commons Debate! The future of the Independent Living Fund will be debated in the House of Commons for the first time this Wednesday 18th June from 11 – 11.30am. We need to make sure as many MPs know it’s happening and will be there prepared to stand up for the ILF and the future of independent living support for disabled people. The fight for the ILF is far from over. In March the Minister for Disabled People announced a new decision to permanently close the ILF in June 2015 following a ruling by the Court of Appeal in November 2013 which quashed the Government’s previous decision to close. One supportive MP Nic Dakin MP for Scunthorpe has managed to get a debate on the future of the Independent Living Fund for this Wednesday 18th June 11 – 11.30am. Whilst it is only half an hour, it is the first time the ILF and the fundamental question of the removal of disabled people’s right to independent living which its closure represents, has had a debate in Parliament. 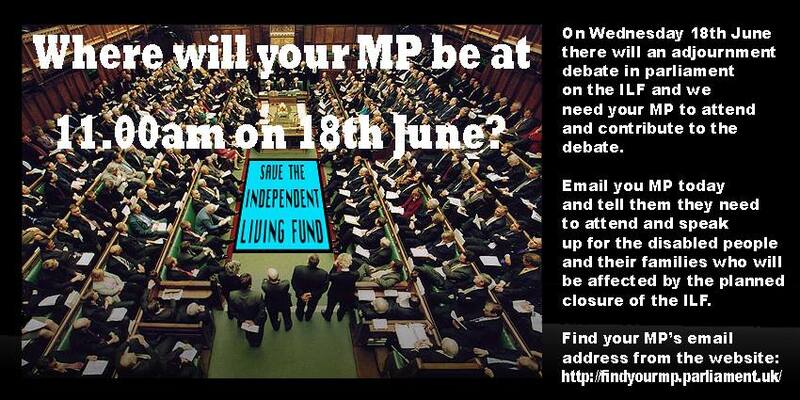 This is an opportunity to make sure politicians know what the ILF is and why it is so important. We need to take urgent action to write to our MPs, urging them to attend the debate, telling them why it matters and most importantly sharing your stories and experiences that show why we need not only to keep the ILF open but to reopen it to new applicants. You can find your MPs email address and post address here. If they can do it in Scotland, why not here?